CraftStudio is an upcoming collaborative gaming making tool for Linux, featuring Minecraft style blocky graphics. Everything is done in real-time, you can collaborate with friends or strangers over the Internet. You can also set up your own server or join an existing project. A store to find and publish models, maps, behaviors or entire games. 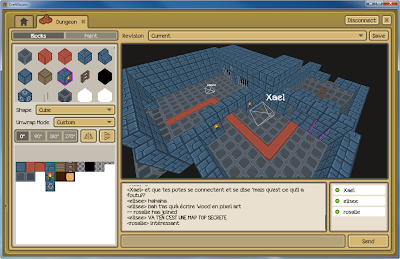 Create any type of game you want: RPG, RTS, Platformer, FPS etc. CraftStudio is currently on Indiegogo looking for funds. With a target of $16K, they have already raised $7K. About 38 days are left in funding campaign. For $10 you will get a CraftStudio premium account and for $20 you will get a premium account plus a copy of their first game (dungeon crawler) made from CraftStudio. There are all sorts of other rewards too. Check out their Indiegogo page.